Composed by Wayne Bergeron. Brass - Trumpet DVD; Method/Instruction; Play-Along. Jazz Play-Along Series. Jazz. DVD. Alfred Music #00-43718. Published by Alfred Music (AP.43718). Trumpeter Wayne Bergeron is a Yamaha Performing Artist and Concord Recording Artist. 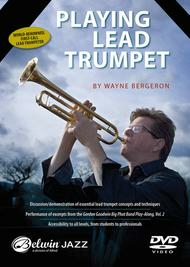 Wayne is enjoying a career as one of the most active lead trumpet players in the world. With the Playing Lead Trumpet DVD, Wayne Bergeron discusses and demonstrates the essential aspects of lead trumpet playing for all levels, from students to professionals. Wayne clearly demonstrates a variety of concepts and techniques using the Gordon Goodwin Big Phat Band Play-Along Series: Trumpet, Volume 2. Topics: Chops---care and maintenance, warm-ups * Equipment---mouthpieces, horns, mutes * Tone/Sound---goals, dos and don'ts * Technique/Breathing---daily exercises, using the diaphram * Range---accuracy, endurance, the 80% level * Articulation/Interpretation---accents (it's in the details) * Concept: swing, Latin, straight-eighths * Ornamentation---doits, falls, turns, rips, bends * Attitude---leadership, professionalism, business * Playing Different Genres---focus, listening * Improvisation---tips and suggestions.